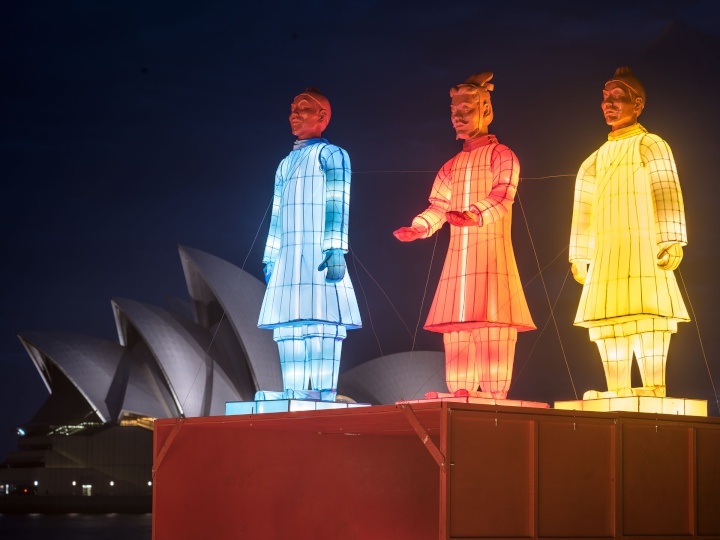 Brightly-coloured lanterns in the shape of China’s famous Terracotta Warriors will soon stand guard outside New Zealand’s national museum Te Papa. The internationally renowned Lanterns of the Terracotta Warriors installation, created by artist Xia Nan, will be on display from 5-24 February. Image of the Laterns on display in the Sydney Harbour. Image courtesy of WREDA. Standing more than two metres tall, the colourful sculptures are accurate replicas of the warriors. Commissioned for the Beijing Olympics in 2008, the acclaimed installation has appeared in iconic locations across the globe including Sydney Harbour, Prague, and Edinburgh. Opening on Chinese New Year’s Day, the lanterns will be free to enjoy through a partnership between the Wellington City Council, Te Papa and WREDA. Visitors can stroll through the lanterns during the day and admire their bright colours, or for a particularly-impressive experience visit during the evening when the lights were turned on. The lanterns are an accompaniment to Te Papa’s Terracotta Warriors: Guardians of Immortality exhibition, which has proven extremely popular since opening in December. WREDA General Manager Events and Experiences Warrick Dent said it was fantastic to have secured such a prestigious international art installation for the Wellington waterfront. Having proven a hit wherever they have been installed across the world, the lanterns were a great edition to Wellington’s bumper summer of events that also included the upcoming kapa haka festival Te Matatini and rap superstar Eminem’s only New Zealand concert. Te Papa Chief Executive Geraint Martin said the lanterns were a great addition to festivities on Wellington’s waterfront.